This chapter defines application architecture and describes how an Oracle database and database applications work in a distributed processing environment. This material applies to almost every type of Oracle Database environment. In the context of this chapter, application architecture refers to the computing environment in which a database application connects to an Oracle database. In the Oracle Database environment, the database application and the database are separated into a client/server architecture. The client runs the database application, for example, SQL*Plus or a Visual Basic data entry program, that accesses database information and interacts with a user. The server runs the Oracle Database software and handles the functions required for concurrent, shared data access to an Oracle database. Although the client application and database can run on the same computer, greater efficiency is often achieved when the client portions and server portion are run by different computers connected through a network. The following sections discuss variations in the Oracle Database client/server architecture. Using multiple hosts to process an individual task is known as distributed processing. Front-end and back-end processing occurs on different computers. In Figure 16-1, the client and server are located on different hosts connected through Oracle Net Services. Description of "Figure 16-1 Client/Server Architecture and Distributed Processing"
Figure 16-2 is a variation that depicts a distributed database. In this example, a database on one host accesses data on a separate database located on a different host. Description of "Figure 16-2 Client/Server Architecture and Distributed Database"
This rest of this chapter applies to environments with one database on one server. Oracle Database client/server architecture in a distributed processing environment provides a number of benefits. Client applications are not responsible for performing data processing. Rather, they request input from users, request data from the server, and then analyze and present this data using the display capabilities of the client workstation or the terminal (for example, using graphics or spreadsheets). Client applications are not dependent on the physical location of the data. Even if the data is moved or distributed to other database servers, the application continues to function with little or no modification. Oracle Database exploits the multitasking and shared-memory facilities of its underlying operating system. Consequently, it delivers the highest possible degree of concurrency, data integrity, and performance to its client applications. Client workstations or terminals can be optimized for the presentation of data (for example, by providing graphics and mouse support), while the server can be optimized for the processing and storage of data (for example, by having large amounts of memory and disk space). In networked environments, you can use inexpensive client workstations to access the remote data of the server effectively. The database can scale as your system grows. You can add multiple servers to distribute the database processing load throughout the network (horizontally scaled), or you can move the database to a minicomputer or mainframe to take advantage of a larger system's performance (vertically scaled). In either case, data and applications are maintained with little or no modification because Oracle Database is portable between systems. In networked environments, shared data is stored on the servers rather than on all computers, making it easier and more efficient to manage concurrent access. In networked environments, client applications submit database requests to the server using SQL statements. After it is received, each SQL statement is processed by the server, which returns results to the client. Network traffic is minimized because only the requests and the results are shipped over the network. In a traditional multitier architecture, an application server provides data for clients and serves as an interface between clients and database servers. An example of a multitier architecture appears in Figure 16-3. Description of "Figure 16-3 A Multitier Architecture Environment"
A client initiates a request for an operation to be performed on the database server. The client can be a Web browser or other end-user program. In a multitier architecture, the client connects to the database server through one or more application servers. An application server provides access to the data for the client. It serves as an interface between the client and one or more database servers, and hosts the applications. An application server permits thin clients, which are clients equipped with minimal software configurations, to access applications without requiring ongoing maintenance of the client computers. The application server can also perform data reformatting for the client, reducing the load on the client workstation. The application server assumes the identity of the client when it is performing operations on the database server for this client. The best practice is to restrict the privileges of the application server to prevent it from performing unneeded and unwanted operations during a client operation. A database server provides the data requested by an application server on behalf of a client. The database performs the query processing. The database server can audit operations performed by the application server on behalf of clients and on its own behalf. For example, a client operation can request information to display on the client, while an application server operation can request a connection to the database server. In unified auditing, the database can append application contexts, which are application-specific name-value pairs, to records in the unified audit trail. You can configure which application contexts the database writes to database audit records. The database can serve as a Web service provider in traditional multitier or service-oriented architecture (SOA) environments. SOA is a multitier architecture relying on services that support computer-to-computer interaction over a network. In the context of SOA, a service is a self-sufficient functional endpoint that has a well defined functionality and service level agreement, can be monitored and managed, and can help enforce policy compliance. SOA services are usually implemented as Web services accessible through the HTTP protocol. They are based on XML standards such as WSDL and SOAP. Database Web services provide a simple way to add Web services to an application environment without the need for an application server. However, invoking Web services through application servers such as Oracle Fusion Middleware offers security, scalability, UDDI registration, and reliable messaging in an SOA environment. However, because database Web services integrate easily with Oracle Fusion Middleware, they may be appropriate for optimizing SOA solutions. In an Oracle Database environment, grid computing is a computing architecture that effectively pools large numbers of servers and storage into a flexible, on-demand computing resource. Modular hardware and software components can be connected and rejoined on demand to meet the changing needs of businesses. A database service is a named representation of one or more database instances. A global service is a service provided by multiple databases synchronized through data replication. Database services represent groups of applications with common attributes, service level thresholds, priorities, scheduling, and functional attributes. Services enable you to group database workloads and route a particular work request to an appropriate database instance. Thus, services provide a single system image to manage competing applications. The number of database instances associated with a service is transparent to the application. Also, the application has no knowledge of where services are offered, providing location transparency. A service can span one or more instances of an Oracle Real Application Clusters (Oracle RAC) database, or multiple databases in a global topology managed by GDS. A single database instance can support multiple services. A service can support exactly one database instance, for functional reasons such as XA affinity and for applications that do not scale well. GDS enables you to integrate locally and globally replicated databases into a GDS configuration that can be shared by global clients. A GDS configuration looks like a virtual multi-instance database to database clients. GDS is the software infrastructure for global services. GDS automates and centralizes configuration, maintenance, and monitoring of a GDS configuration, and enables load balancing and failover for global services. The framework manages these virtualized resources with minimal administrative overhead, enabling the GDS configuration to handle additional client requests. Enables high-performance farms of read-only databases. Enables creation, management, and monitoring of Data Guard configurations that include a primary database and up to 30 standby databases. Enables replication updates among multiple databases. Figure 16-4 shows a sample GDS configuration. All databases in the GDS configuration communicate with all GSMs, even though the diagram does not illustrate all these connections (to avoid complicating the diagram). The following sections describe the components. Description of "Figure 16-4 Sample GDS Configuration"
"High Availability and Unplanned Downtime"
A GDS configuration is a named, self-contained system of databases integrated into a single virtual server that offers one or more global services. Essentially, a GDS configuration provides benefits to a set of databases that are analogous to the benefits that Oracle Real Application Clusters (Oracle RAC) provides a single database. The databases in a GDS configuration can be locally or globally distributed. Clients can connect to the GDS configuration by specifying a global service name, without needing to know about the components and topology of the GDS configuration. In this sense, client connections to a GDS configuration are analogous to client connections in Oracle RAC. "GDS Architecture" shows one GDS configuration that contains 11 databases. DB1, DB2, and DB5 are Oracle RAC databases that use GoldenGate for replication. All three databases are protected by Data Guard. CAT is a database, also protected by Data Guard, which stores the metadata needed for GDS. DB5 is an Oracle RAC database that is protected by standby database DB6. A GDS pool is a named set of databases within a GDS configuration that provides a unique set of global services and belongs to the same administrative domain. Partitioning of databases into pools simplifies service management. It also provides higher security by allowing each pool to be managed by a different administrator. A database can only belong to a single pool. All databases in a pool need not provide the same set of global services. However, all databases that provide the same global service must belong to the same pool. "GDS Architecture" shows two GDS pools, SALES and HR. Each pool is associated with its own set of global services. A GDS region is a logical boundary that contains database clients and servers that are geographically or otherwise related to each other. For example, a region might correspond to a data center. Typically, the members of a region share network proximity and are members of the same local area network (LAN) or metropolitan area network (MAN). A GDS configuration can contain multiple regions. "GDS Architecture" shows a Western region and an Eastern region. Each region must have at least one global service manager. A region can contain databases that belong to different pools. In "GDS Architecture", databases DB1 and DB2 are in the same pool, but in different regions. However, all the pools must belong to the same GDS configuration. A global service manager is the central software component of GDS, providing service-level load balancing, failover, and centralized management of services in the GDS configuration. A global service manager is associated with one and only one GDS configuration. Multiple global service managers can exist for a single GDS configuration to improve availability and performance. Every global service manager in a GDS configuration manages all global services supported by the configuration. gdsctl is a command-line tool that provides user interface to the GDS framework. To execute a command, gdsctl may need to establish an Oracle Net connection to a global service manager, GDS catalog database, or a GDS database. "GDS Architecture" shows two global service managers in each region. Each manager can be on a different host. gdsctl issues commands to the global service managers. A GDS catalog is a metadata repository that stores configuration data for a GDS configuration and all its global services. One and only one catalog exists for each GDS configuration. A GDS catalog resides in an Oracle database. The catalog itself consists of tables, views, and related database objects and structures. 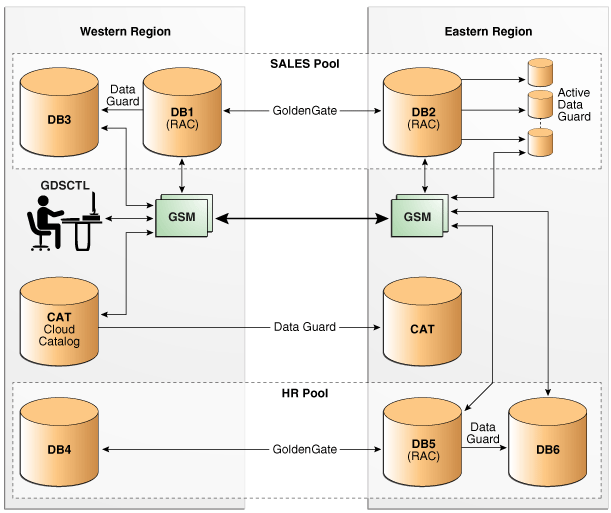 "GDS Architecture" shows a GDS catalog database CAT in the Western region protected by a standby database in the Eastern region. Oracle Net Services is a suite of networking components that provides enterprise-wide connectivity solutions in distributed, heterogeneous computing environments. Oracle Net Services enables a network session from an application to a database instance and a database instance to another database instance. Oracle Net Services provides location transparency, centralized configuration and management, and quick installation and configuration. It also lets you maximize system resources and improve performance. The shared server architecture increases the scalability of applications and the number of clients simultaneously connected to the database. The Virtual Interface (VI) protocol places most of the messaging burden on high-speed network hardware, freeing the CPU. Oracle Net Services uses the communication protocols or application programmatic interfaces (APIs) supported by a wide range of networks to provide distributed database and distributed processing. After a network session is established, Oracle Net Services acts as a data courier for the client application and the database server, establishing and maintaining a connection and exchanging messages. Oracle Net Services can perform these tasks because it exists on each computer in the network. Oracle Database protocols accept SQL statements from the interface of the Oracle applications, and then package them for transmission to Oracle Database. Transmission occurs through a supported industry-standard higher level protocol or API. Replies from Oracle Database are packaged through the same higher level communications mechanism. This work occurs independently of the network operating system. Depending on the operating system that runs Oracle Database, the Oracle Net Services software of the database server could include the driver software and start an additional background process. The Oracle Net Listener (the listener) is a server-side process that listens for incoming client connection requests and manages traffic to the database. When a database instance starts, and at various times during its life, the instance contacts a listener and establishes a communication pathway to this instance. The following graphic shows two databases, each on a separate host. The database environment is serviced by two listeners, each on a separate host. 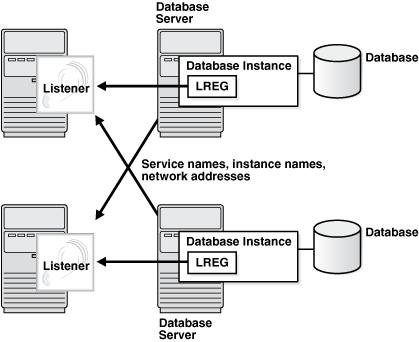 The LREG process running in each database instance communicates with both listeners to register the database. Description of "Figure 16-5 Two Listeners"
Figure 16-6 shows a browser making an HTTP connection and a client making a database connection through a listener. The listener does not need to reside on the database host. Description of "Figure 16-6 Listener Architecture"
A client process or another database requests a connection. The listener selects an appropriate service handler to service the client request and forwards the request to the handler. The client process connects directly to the service handler. The listener is no longer involved in the communication. "Overview of Client Processes" and "Overview of Server Processes"
A service name is a logical representation of a service used for client connections. When a client connects to a listener, it requests a connection to a service. When a database instance starts, it registers itself with a listener as providing one or more services by name. Thus, the listener acts as a mediator between the client and instances and routes the connection request to the right place. A single service, as known by a listener, can identify one or more database instances. Also, a single database instance can register one or more services with a listener. Clients connecting to a service need not specify which instance they require. Figure 16-7 shows one single-instance database associated with two services, book.example.com and soft.example.com. The services enable the same database to be identified differently by different clients. A database administrator can limit or reserve system resources, permitting better resource allocation to clients requesting one of these services. Description of "Figure 16-7 Multiple Services Associated with One Database"
In Oracle Net, service registration is a feature by which the LREG process dynamically registers instance information with a listener. Service registration is dynamic and does not require configuration in the listener.ora file. Dynamic registration reduces administrative overhead for multiple databases or instances. The initialization parameter SERVICE_NAMES lists the services an instance belongs to. On startup, each instance registers with the listeners of other instances belonging to the same services. During database operations, the instances of each service pass information about CPU use and current connection counts to all listeners in the same services. This communication enables dynamic load balancing and connection failover. In a dedicated server architecture, the server process created on behalf of each client process is called a dedicated server process (or shadow process). A dedicated server process is separate from the client process and acts only on its behalf, as shown in Figure 16-8. Description of "Figure 16-8 Oracle Database Using Dedicated Server Processes"
A one-to-one ratio exists between the client processes and server processes. Even when the user is not actively making a database request, the dedicated server process remains—although it is inactive and can be paged out on some operating systems. Figure 16-8 shows user and server processes running on networked computers. However, the dedicated server architecture is also used if the same computer runs both the client application and the database code but the host operating system could not maintain the separation of the two programs if they were run in a single process. Linux is an example of such an operating system. If the client process and the dedicated server process run on the same computer, then the program interface uses the host operating system's interprocess communication mechanism to perform its job. If the client process and the dedicated server process run on different computers, then the program interface provides the communication mechanisms (such as the network software and Oracle Net Services) between the programs. Underutilized dedicated servers sometimes result in inefficient use of operating system resources. Consider an order entry system with dedicated server processes. A customer places an order as a clerk enters the order into the database. For most of the transaction, the clerk is talking to the customer while the server process dedicated to the clerk's client process is idle. The server process is not needed during most of the transaction, and the system may be slower for other clerks entering orders if the system is managing too many processes. For applications of this type, the shared server architecture may be preferable. The shared pool eliminates the need for a dedicated server process for each connection. An idle shared server process from the pool picks up a request from a common queue. A small number of shared servers can perform the same amount of processing as many dedicated servers. Every dedicated or shared server has a PGA. Fewer server processes means fewer PGAs and less process management. Shared server has several disadvantages, including slower response time in some cases, incomplete feature support, and increased complexity for setup and tuning. As a general guideline, only use shared server when you have more concurrent connections to the database than the operating system can handle. To use shared servers, a client process must connect through Oracle Net Services, even if the process runs on the same computer as the Oracle Database instance. A database can support both shared server and dedicated server connections simultaneously. For example, one client can connect using a dedicated server while a different client connects to the same database using a shared server. A request from a user is a single API call that is part of the user's SQL statement. The dispatcher places the request on the request queue, where it is picked up by the next available shared server process. The request queue is in the SGA and is common to all dispatcher processes of an instance. The shared server processes check the common request queue for new requests, picking up new requests on a first-in-first-out basis. One shared server process picks up one request in the queue and makes all necessary calls to the database to complete this request. A different server process can handle each database call. Therefore, requests to parse a query, fetch the first row, fetch the next row, and close the result set may each be processed by a different shared server. When the server process completes the request, it places the response on the calling dispatcher's response queue. Each dispatcher has its own response queue. The dispatcher returns the completed request to the appropriate client process. For example, in an order entry system, each clerk's client process connects to a dispatcher. Each request made by the clerk is sent to this dispatcher, which places the request in the queue. The next available shared server picks up the request, services it, and puts the response in the response queue. When a request is completed, the clerk remains connected to the dispatcher, but the shared server that processed the request is released and available for other requests. While one clerk talks to a customer, another clerk can use the same shared server process. Figure 16-9 shows how client processes communicate with the dispatcher across the API and how the dispatcher communicates user requests to shared server processes. Description of "Figure 16-9 The Shared Server Configuration and Processes"
The dispatcher processes enable client processes to share a limited number of server processes. You can create multiple dispatcher processes for a single database instance. The optimum number of dispatcher processes depending on the operating system limitation and the number of connections for each process. Each client process that connects to a dispatcher must use Oracle Net Services, even if both processes run on the same host. When an instance starts, the network listener process opens and establishes a communication pathway through which users connect to Oracle Database. Each dispatcher process gives the listener process an address at which the dispatcher listens for connection requests. At least one dispatcher process must be configured and started for each network protocol that the database clients will use. If the listener determines that a shared server process is required, then the listener returns the address of the dispatcher process that has the lightest load, and the client process connects to the dispatcher directly. If the process cannot communicate with the dispatcher, or if the client process requests a dedicated server, then the listener creates a dedicated server process and establishes an appropriate connection. Each shared server process serves multiple client requests in the shared server configuration. Shared and dedicated server processes provide the same functionality, except shared server processes are not associated with a specific client process. Instead, a shared server process serves any client request in the shared server configuration. The PGA of a shared server process does not contain UGA data, which must be accessible to all shared server processes. The shared server PGA contains only process-specific data. All session-related information is contained in the SGA. Each shared server process must be able to access all sessions' data spaces so that any server can handle requests from any session. Space is allocated in the SGA for each session's data space. "Overview of the Program Global Area (PGA)"
Specific administrative activities cannot be performed while connected to a dispatcher process, including shutting down or starting an instance and media recovery. These activities are typically performed when connected with administrator privileges. To connect with administrator privileges in a system configured with shared servers, you must specify that you are using a dedicated server process. Database Resident Connection Pooling (DRCP) provides a connection pool of dedicated servers for typical Web application scenarios. A Web application typically makes a database connection, uses the connection briefly, and then releases it. Through DRCP, the database can scale to tens of thousands of simultaneous connections. Complements middle-tier connection pools that share connections between threads in a middle-tier process. Enables database connections to be shared across multiple middle-tier processes. These middle-tier processes may belong to the same or different middle-tier host. Enables a significant reduction in key database resources required to support many client connections. For example, DRCP reduces the memory required for the database and boosts the scalability of the database and middle tier. The pool of available servers also reduces the cost of re-creating client connections. Provides pooling for architectures with multi-process, single-threaded application servers, such as PHP and Apache, that cannot do middle-tier connection pooling. DRCP uses a pooled server, which is the equivalent of a dedicated server process (not a shared server process) and a database session combined. The pooled server model avoids the overhead of dedicating a server for every connection that requires the server for a short period. Clients obtaining connections from the database resident connection pool connect to an Oracle background process known as the connection broker. The connection broker implements the pool functionality and multiplexes pooled servers among inbound connections from client processes. As shown in Figure 16-10, when a client requires database access, the connection broker picks up a server process from the pool and hands it off to the client. The client is directly connected to the server process until the request is served. After the server has finished, the server process is released into the pool. The connection from the client is restored to the broker. Description of "Figure 16-10 DRCP"
In DRCP, releasing resources leaves the session intact, but no longer associated with a connection (server process). Unlike in shared server, this session stores its UGA in the PGA, not in the SGA. A client can reestablish a connection transparently upon detecting activity. The program interface is the software layer between a database application and Oracle Database. The Oracle code acts as a server, performing database tasks on behalf of an application (a client), such as fetching rows from data blocks. The program interface consists of several parts, provided by both Oracle Database software and operating system-specific software. The program interface consists of several different components. The user and Oracle Database sides of the program interface run Oracle software, as do the drivers. A driver is a piece of software that transports data, usually across a network. Drivers perform operations such as connect, disconnect, signal errors, and test for errors. Drivers are specific to a communications protocol. A default driver always exists. You can install multiple drivers, such as the asynchronous or DECnet drivers, and select one as the default driver, but allow a user to use other drivers by specifying a driver when connecting. Different processes can use different drivers. A process can have concurrent connections to a single database or to multiple databases using different Oracle Net Services drivers. The lowest-level software connecting the user side to the Oracle Database side of the program interface is the communications software, which the host operating system provides. DECnet, TCP/IP, LU6.2, and ASYNC are examples. The communication software can be supplied by Oracle, but it is usually purchased separately from the hardware vendor or a third-party software supplier.